Check out this great kit from our friends at Pathfinders! 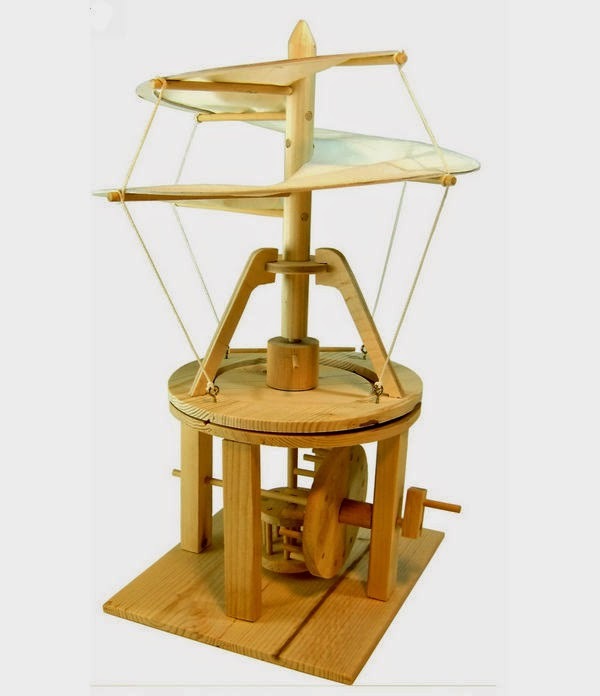 This time they've designed a wooden kit that allows you to make a replica of Leonardo da Vinci design for the world's first helicopter. One of Leonardo's most iconic images, the Aerial Screw (also known as the Helicopter) illustrates the ingenuity of da Vinci, and indicates his obsession with flying. While this idea may never have got off the ground, for some basic technical reasons, it gave us an insight into the different ways in which Leonardo considered the challenge of human powered flying, and defines him as an inventor well ahead of his time. While it is often referred to as a helicopter, the premise of the lift to make it rise is more like archimedes screw than the rotors of a helicopter. The kit comes complete with all pieces pre-cut and ready to assemble. Even the glue included! Just follow the easy-to-understand instructions, and in a few hours you will have a completed kit. Mind you, it doesn't fly, but it's wonderful fun to turn the crank, watch the pinwheel gears and see the helical screw spin. A great project for young and old.